In the era of always-on, personalized information and trusted WOM at scale, it is time to update our customer journey models to recognize how great customer experience drives WOM, and great WOM drives business outcomes. Marketers need a new and better framework–one that considers the entire virtuous circle from buy to own to advocate and back to buy, again. 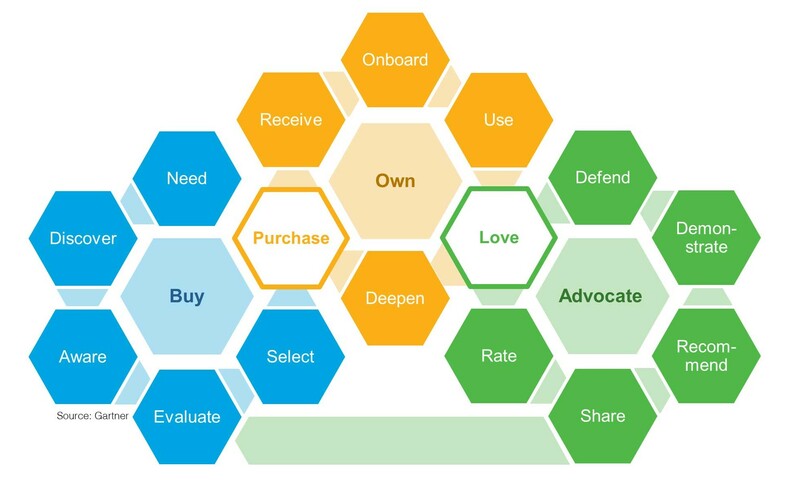 The customer journey model we use on the Gartner for Marketing Leaders team–the Buy/Own/Advocate framework–recognizes that strong brands aren’t merely better at acquiring customers; they are better at keeping them and motivating them to tell others. This is why improving CX isn’t just the right thing to do for your customers; it is also the right thing to do for your organization and its stakeholders. Starbucks is not unique. Krispy Kreme created 21 consecutive quarters of same-store growth with “very little measured-media spending and no agency of record,” and Spanx became a billion-dollar brand with little advertising, because “The power of women discovering the brand from other women was actually a better strategy.” While these brands have been particularly proficient at activating their Buy/Own/Advocate customer journeys, every organization has an opportunity to craft better experiences and improve marketing results; WOMMA found that WOM drives an average of 13% of sales across categories. The goal of many customer experience management efforts is to improve customer satisfaction, but great brands aim for more–they succeed at creating love (or if you find that term too demonstrative, call it an immense feeling of affinity for the brand.) Our model recognizes that Love is the stage in the journey where true loyalty and advocacy are created, two objectives that some organizations understand and measure poorly. Decades of research validates that mere satisfaction is not enough. A famous study in the 1990s revealed that customers of Xerox, a company in a highly competitive marketplace, were six times more likely to repurchase Xerox products if they were totally satisfied customers (5 on a 5-point scale) compared to those who were merely satisfied (4 on a 5-point scale). More recently, an MIT Sloan study found that the correlation between companies’ customer-satisfaction levels and stock performance explained only 1% of the variation in a company’s market return. As demonstrated in the Buy/Own/Advocate journey model, strong brands with great customer experience don’t settle for satisfaction. They build additional steps to move customers not just to Use but Love. If we can deliver customers to the Love stage, we keep them in the Own cycle, deepening the relationship, decreasing churn, lifting share of wallet and increasing customer lifetime value. And if we invite customers to Love our brand, we also earn the right to shepherd them into the next cycle, the one so important in the era of always-on information, social media and trusted WOM: Advocacy. It is here where today’s customers help the brand attract tomorrow’s. 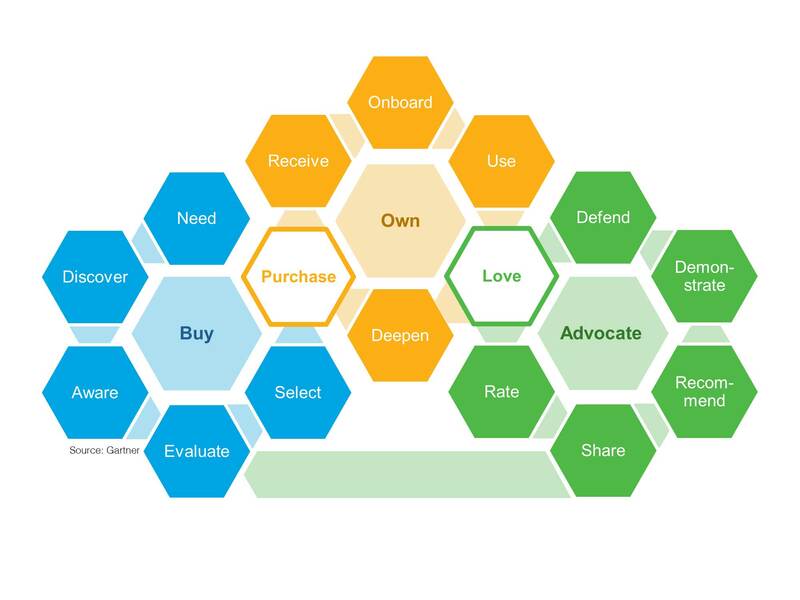 If you are a Gartner subscriber, you can learn more about the steps in the Buy/Own/Advocate journey, how to measure loyalty and advocacy, and the ways this new customer journey model can be used to improve your brand’s customer journey mapping efforts. You will find this guidance in our new report, “Use Gartner’s Buy/Own/Advocate Framework to Map Customer Journeys and Deliver Better Customer Experiences,” along with our other recent research that can help to inform your customer experience management efforts. You said “strong brands with great customer experience don’t settle for satisfaction…” — also your point about Starbucks and Krispy Kreme resisting the urge to merely throw more cash down the inert advertising Money Pit is paramount. Besides, while all the parts of the customer journey model are important, given my own experience (B2B marketing), it seems that the latter section of the journey doesn’t receive the attention it deserves. In particular, marketers typically don’t create content assets that make it easy for their key stakeholders to Advocate for a brand. Regarding ‘the Love stage’, perhaps Led Zeppelin said it best — You need cooling; Baby I’m not fooling; I’m gonna send ya; Back to schooling (lyrics: Whole Lotta Love). How could I not like a comment that quotes Led Zeppelin? I agree that B2B brands continue to have opportunities in content marketing that are stronger than in many other verticals. That said, I always caution brands not to gravitate too much to their own content as a means for advocacy. It certainly is a vital part of the puzzle, but in B2B, getting advocate customers to be centers of influence and create their own powerful and authentic content (anything from simple endorsements to user conference decks to becoming references) is also, obviously, very important. I also agree with you that the Advocate cycle is the one that gets too little attention, but many brands aren’t in a position to get advocacy by focusing on advocacy or content strategies. They need to use the entire journey model to create more highly satisfied customers that love their brand (and THEN they can execute those advocacy and content strategies). Thanks for the dialog, David. The advocacy focused content part is a valid observation. As a fellow B2B marketer I’ve always gotten around that via case studies. Case studies are brilliant. They validate leadership thinking content you have been producing by being proof that such thinking can be put into practice. Case studies constructed around how solutions remove constraints to growth for customers are powerful advocacy ammunition.